OLNEY, MD, August 17, 2016 — Drs. Raymond and Gabriella Moss, leading community advocates of non-opioid treatment for acute and chronic pain, announce the publication of an important positioning paper, ‘Chiropractic: A Safer Strategy Than Opioids,’, by The Foundation for Chiropractic Progress (F4CP)–the voice of the chiropractic profession. Drs. Raymond and Gabriella Moss point out that the paper articulates the value of a conservative, non-pharmacologic approach as an important option for pain management — particularly for back and neck pain, headaches, neuro-musculoskeletal and other related conditions. 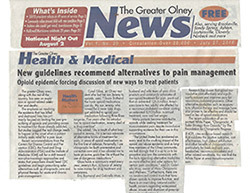 Citing evidence-based research to validate the positive outcomes, cost effectiveness, high patient satisfaction and other benefits of chiropractic care, the white paper follows on the recent recommendations from the Centers for Disease Control and Prevention (CDC), the Food and Drug Administration (FDA) and the Institute of Medicine (IOM) which call for a shift away from opioid use toward non-pharmacologic approaches to address chronic pain. “Montgomery County has seen an explosion in opioid-related deaths. It is our goal to arm the community with the facts and heighten awareness regarding chiropractic care and other alternative modalities as better options to opioid treatment”, states Dr. Gabriella Moss. An estimated 126.6 million Americans (one in two adults) are affected by a neuro-musculoskeletal condition costing an estimated $213 billion in annual treatment, care and lost wages, according to a new report issued by the United States Bone and Joint Initiative (USBJI). “With millions of Americans suffering with nonspecific low back pain, it is of special note that an additional research report published by AHRQ shows that spinal manipulative care effectively and significantly reduces pain and improves pain for these patients, says Dr. Meeker. Chiropractic is the largest, and best recognized of the complementary and alternative health care professions. In fact, patient surveys reported in the Annals of Internal Medicine show that chiropractors are used more often than any other alternative provider group and patient satisfaction with chiropractic care is very high. Use of chiropractic in the United States has tripled in the past two decades. Prescribers should heed CDC guidelines and begin prescribing safer alternatives such as chiropractic care for chronic pain management. Pharmaceutical manufacturers should institute more responsible marketing and physician education that will result in improved prescribing habits. Hospital emergency rooms should evaluate their options for managing patients’ pain without the use of opioid painkillers. Payers and plan sponsors – both government and commercial – should make chiropractic care and other alternative modalities an accessible, affordable, option for chronic pain relief, with reimbursement of DCs as covered providers. Chiropractic services should be expanded in the Department of Defense and veteran’s health care systems since neuro-musculoskeletal pain is one of the leading causes of disability in the active military and veteran populations. As primary care professionals for spinal health and well-being, doctors of chiropractic – who receive a minimum of seven years of higher education – are specifically trained to diagnose, evaluate and provide non-pharmaceutical care and rehabilitation to individuals suffering from acute and chronic back, low back and neck pain, headaches, neuro-musculoskeletal and other related conditions. The Olney area is fortunate to have excellent chiropractors and alternative health care providers to choose from. Drs. Gabriella and Raymond Moss opened Moss Chiropractic and Wellness in 1987 and have helped thousands of people seeking relief from acute and chronic pain over the last 30 years. They are a husband and wife team of dedicated chiropractors with a staff of highly skilled professionals who are committed to the health of their patients and the community. The recent opioid epidemic has heightened the necessity of taking a proactive role about educating the public regarding alternative treatments to opioids and the benefits of Chiropractic and Wellness based care. Moss Chiropractic and Wellness is located in the Fair Hill Shopping Center in Olney, MD.